If you are anything like myself, you would have spent what is likely to be a large sum of cash over a period of time, whittling away in the arcade alleys of your childhood. More than likely you will have also come across the arcade classic 'Teenage Mutant Ninja Turtles : Turtles In Time', well the Turtles are back, and this old coin shifter has been given a facelift. Playing as one of the four famous shelled guys, you battle your way through series of levels against various foot soldiers, creatures, and end of level bosses. The game play has kept with the traditional arcade as it's a sidescroller with a simple jump/attack button system, but it has been given a few small tweaks in shell powerups allowing a few seconds of a special move, and also they've dropped in a full 360 degree fighting range to allow bigger battle scenes. A good amount of variance is thrown in with the different Turtles having different attributes. For instance Leonardo with his katana will have a greater range than Raphael and his sai, though Raph has the greater fighting speed and attack power. Each turtle also has a slightly altered story line to follow also, which in short, revolve around the evil brain Krang, and foot clan leader Shredder, sending the turtles through time, leaving them to have to fight in the past and future to make their way home. With a port like this it's a no brainer that difficulty settings have to be added. Working from the easiest setting, you could finish this game in around an hour, but moving up to the harder settings, it regains that battle toughness of the 16Mhz original. Visually this game is quiet a feast compared to it's original incarnation. The game has been lovingly restored to a High Definition Widescreen format, the graphics have also been converted to a 3d display, and the backgrounds have been developed into lush colourful scenes. This has allowed the game to bring on a sort of new life, and will have a better chance of maintaining the turtle fans who may of only watched the modern day versions of the green four. The audio has also evolved, not always for the best, as some arcade games such as this have some pretty iconic background level tracks and it is sad to see them replaced. Probably the biggest promise for this game is the multiplayer aspect. Much like the towering machines of old, you and three others can all battle in a co-op game, each with your own character. On top of this you can also play co-op with online players to change things up a bit, though the ability to drop in to a game has been removed to much disappointment. 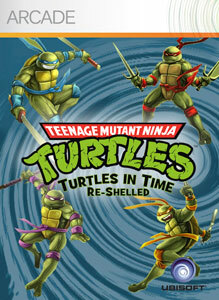 Turtles In Time Re-Shelled has managed to maintain much of its original title while still evolving to a more modern and accessible state, Not an easy task by any means, and while there are a few great points that were dropped from this port, it has kept just enough to give it a great nostalgic feel.